Tekken 3D Prime Edition is due to release across Europe on 17th February 2012, Nintendo and Namco Bandai have today confirmed. As with One Piece Unlimited Cruise Special, a distribution agreement will see Nintendo responsible for the sales, marketing and distribution of the game throughout the region, as well as Australia. You’ll be able to choose from a selection of over forty characters within the game, to then battle on both entirely new and redesigned classic stages especially for the Nintendo 3DS. For the first time on the handheld, a full-length CG movie will be included on the game cartridge. 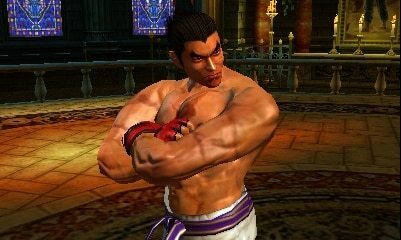 Tekken Blood Vengeance, which explores the history and legacy of the Tekken universe, will be available to be viewed in glasses-free stereoscopic 3D, and is produced by Digital Frontier (Resident Evil: Degeneration, Death Note, Appleseed) and directed by Youichi Mouri (opening movies for Tekken 5 and Tekken 6: Bloodline Rebellion).